Replies: 0 (Who? ), Viewed: 450 times. #1 24th Mar 2019 at 6:58 PM Last edited by CmarNYC : 24th Mar 2019 at 8:22 PM. 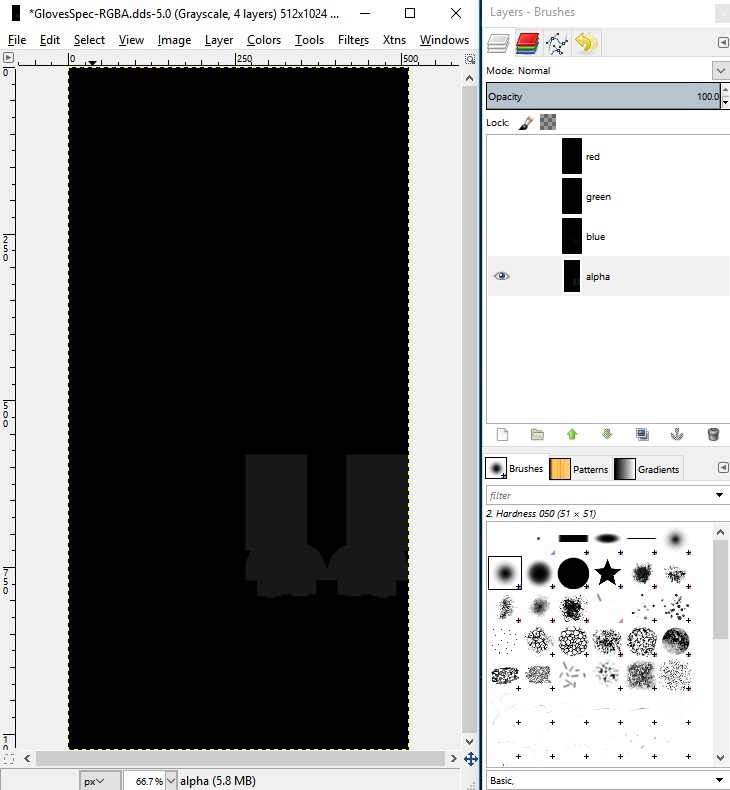 What this tutorial will do: Show how to do a very simple edit of a specular map in GIMP and apply it to a CAS item using CAS Tools. For this tutorial I'm going to use a clone of the EA yfAcc_GlovesSophisticate. 1. First, create the clone - open CAS Tools, set the species, gender, age, and type filters and click the 'Clone Game CAS Parts' radio button. When the list appears, select 'yfAcc_GlovesSophisticate', select whichever swatches you want to include, change the item name at the bottom to describe your custom content, and click the Clone! button. 2. Go to the Clone Package Editor tab and open the package you just created. In the General CAS Part Properties tab click the specular texture and export it. 3. Open up the specular texture in GIMP. 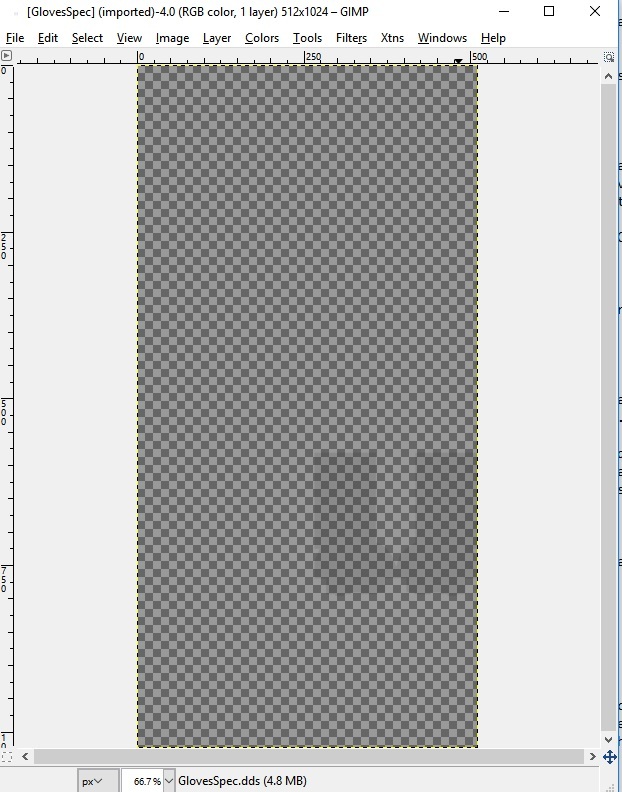 You can see the shape of the gloves faintly under the alpha layer checkerboard. Since the amount of opacity in the alpha channel controls the intensity of shine (no transparency = very shiny, full transparency = no shine), you can see there's a moderate shine. 5. 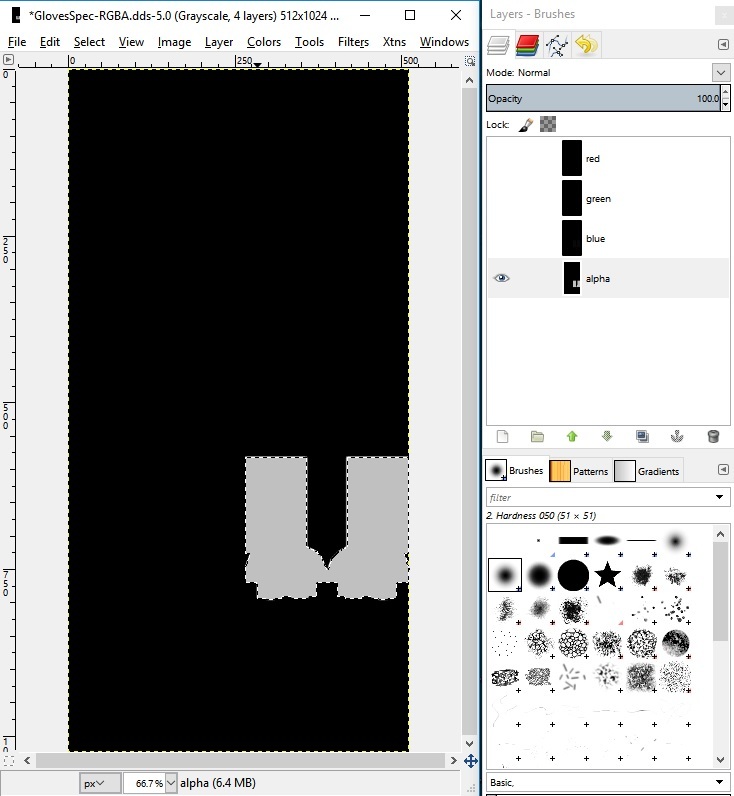 Now, in the alpha layer, you can select the dark gray area that's mapped to the gloves by using the Fuzzy Select tool. Fill it with light gray - the lighter the gray, the more shine. 6. Click Colors / Components / Recompose to update the original specular image with your changes. Save as DDS, DXT5 compression, Generate MipMaps. 7. Import into your cloned package. Using CAS Tools, open the package in the Clone Package Editor tab, go back to the General CAS Part Properties tab, click the specular, and import your DDS image. Click Commit Changes. If all has gone well, you'll see increased shine in the Previewer tab. Save the package. TS4 speculars contain a mask channel in addition to the standard RGBA channels. The mask controls where the shine shows and where it's disabled, much like the alpha channel in diffuse textures. When CAS Tools imports a specular DDS, it creates the mask from the alpha, since an area with shine intensity of zero performs the same function as a fully transparent mask area. 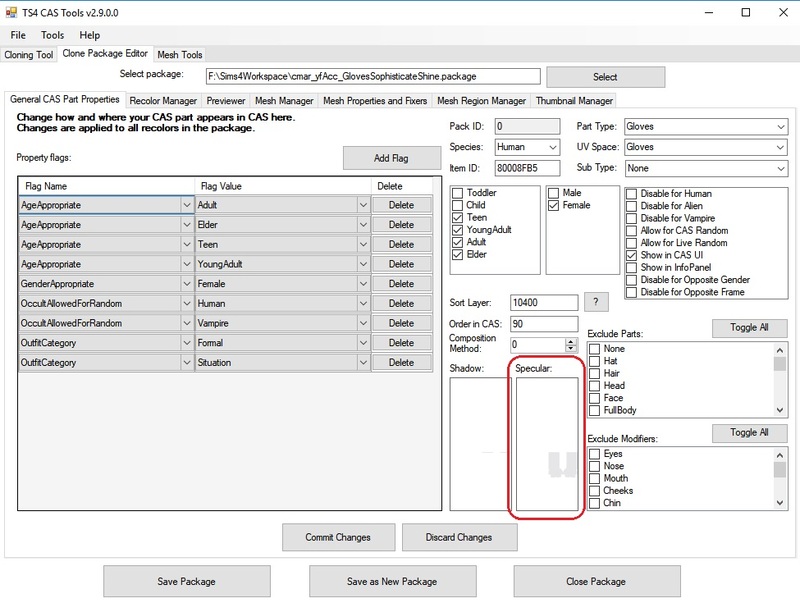 The next version of CAS Tools will optionally import/export the mask separately. Mask = controls where this specular is applied on the sim's body/clothing. For items with no specular, you can use the diffuse texture as a guide - resize to 512 x 1024, decompose it, fill the red, green, and blue layers with black, and continue as above.